Elvis Presley continues to fascinate legions of American and international fans, decades after his demise. 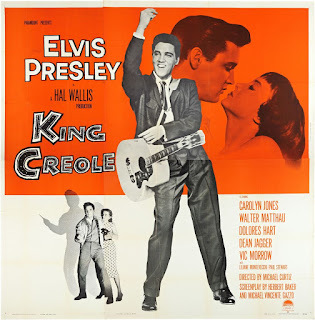 The King of Rock and Roll may have been born in Tupelo and made Memphis his home, but his Arkansas connections are long and deep. 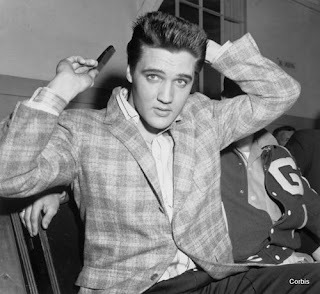 Whether it's the Municipal Theater where he sang with the likes of Johnny Cash in 1955, the Trio Club in Pine Bluff where he bonded with The Browns, the juke joints along US Highway 67 around Walnut Ridge or The Old South Restaurant where he often dined in Russellville, it's true that Elvis loved himself some Arkansas. 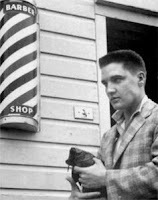 But the buzz and snips from one Arkansas locale were heard around the world when Elvis when he was drafted for the US Army. 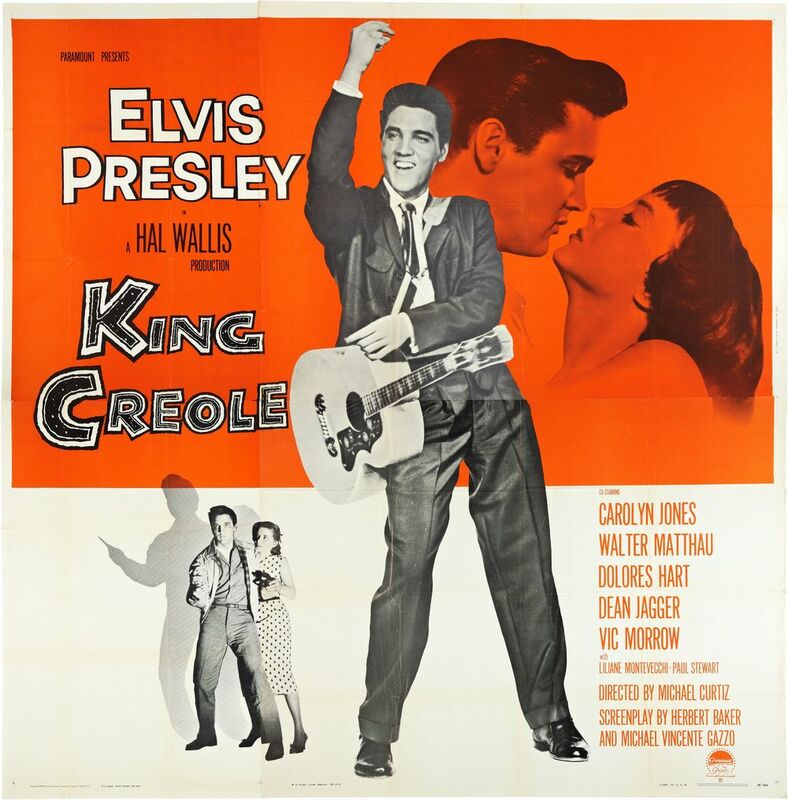 He didn't go right away when he received the notice in 1957 because he was filming King Creole, and he got an exemption allowing him to finish the movie not on his behalf but because the studio had already invested a lot of time and money into the film. Eventually, though, he had to go. I will preface this to say that I've heard many times about Elvis being at Fort Chaffee. Years before there was a museum, I heard the tale from BJ Sams. BJ and I worked together on Today's THV This Morning for eight years, and I am proud to call him my friend. 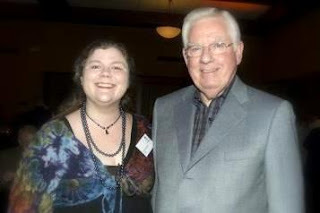 Now that we're both retired from the station, I don't get to see him as much. BJ's connection? He and Elvis both arrived at Fort Chaffee on the same day, and both went through having their hair clipped to regulation length. And both went on to have very meaningful, memorable lives. 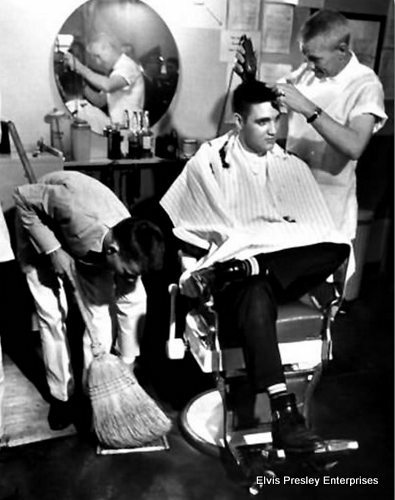 Part of the reason all those Elvis fans were in a tizzy was because Army regulations stipulated a clean, short haircut - a crewcut, if you will. 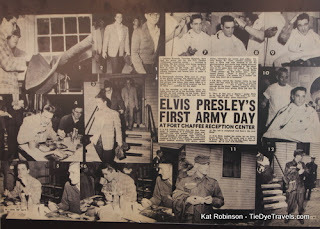 Once the rumor got out that Elvis planned to join the Army, folks got to hemming and hawing. Senators checked to see if there were some way he could get an exemption and keep his sideburns and pompadour, on the request of some of his fans. 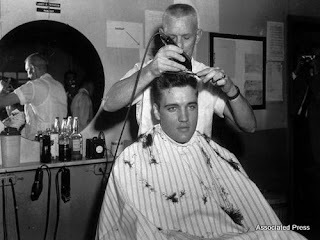 He knew he was getting a haircut, so Elvis got a jump on the barber and had his stylist go ahead and trim down his hair and sideburns before he went. 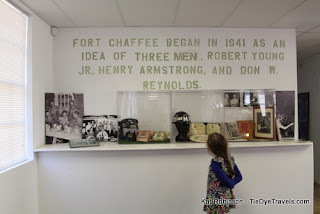 That morning, after stopping for breakfast at The Coffee Cup in West Memphis, Elvis Presley went to Fort Chaffee. 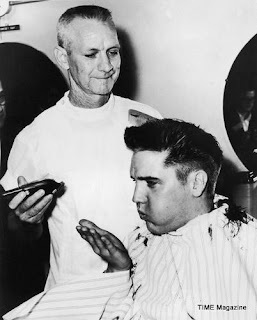 And once his physical was done, he went and had a seat in the barber's chair. Dozens of photographers were there to document the moment. Now, you should know the name of the guy doing the cutting there... that's James "Pete" Peterson, and he was in charge of the barbers at that shop at Fort Chaffee. His son has made donations to the museum and, from what I understand, also gives Elvis Army haircuts during some special celebrations at the facility. would have been swept up all over the place, and it would have included the hair of any of the young men who had been inducted into the US Army that day. Frankly, I suspect if you brought all that hair together, it'd be far more than would fit on the average head. What's probably most surprising about Elvis and his stay at Fort Chaffee, was that he was just there for three days before being shipped out. But there are all sorts of Fort Smith Elvis stories. Go figure. 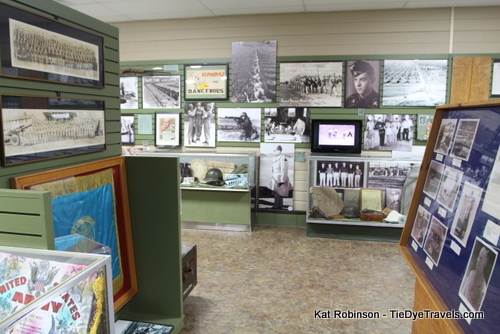 Museum was opened at Chaffee Crossing, a portion of the former Fort Chaffee that's now being commercially developed for a variety of uses. 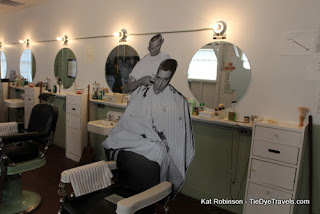 It started out as a place to celebrate The King's cropped top and to show off the old barber chairs used at Fort Chaffee. But other things were added, too. 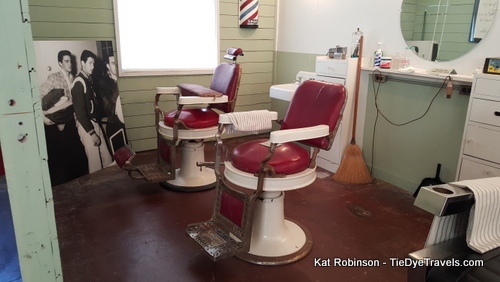 For instance, these two red barber's chairs came from a barbershop downtown on Garrison Avenue, and they have a completely different claim to fame. 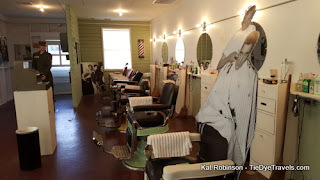 The story goes, the famed criminals Bonnie and Clyde came in and had haircuts and sat in these very chairs. They're preserved here, now. 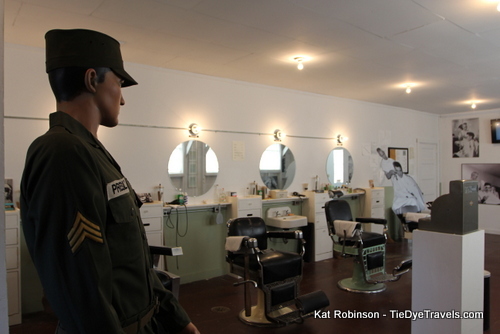 The big room where the barbershop is located is inside one of the old barracks on the property. 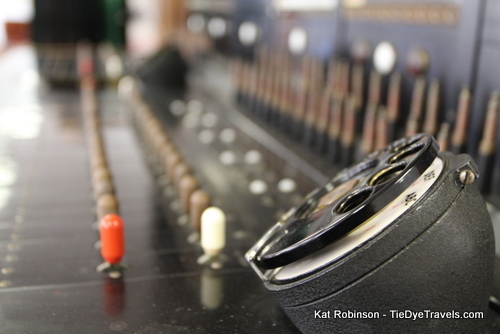 It may not have been the exact building but it has been reconstructed to be as accurate as possible. There's a cardboard cutout of Elvis and Peterson in the end chair. And you'll see a lot of other neat things, like the different grooming products used back in the 1950s that might have been out that particular day. 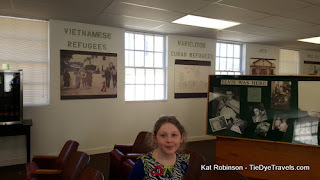 World War II to Vietnamese refugees who were housed here after the Saigon Airlift; Cuban refugees and prisoners in 1980 and Katrina refugees - a different sort of refugee - brought here in 2005 when that hurricane struck New Orleans and the Mississippi Gulf Coast and left thousands with no roof over their heads. 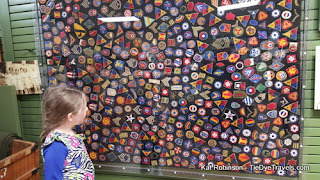 There's also a loop that plays concerning the three movies filmed at Fort Chaffee - Biloxi Blues, The Tuskegee Airmen and A Soldier’s Story. I want to go back and study closely. There's so much about Fort Chaffee at the facility, that another building will soon be converted for use. The two-story barrack will house most of the Chaffee Military Museum, and will hopefully be up and running within three years. 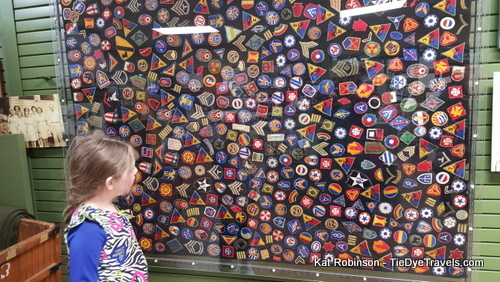 So Elvis may bring a lot of people to Fort Smith (and yes, there are a LOT of Elvis fans who make the pilgrimage), but there's a lot more to see, too. 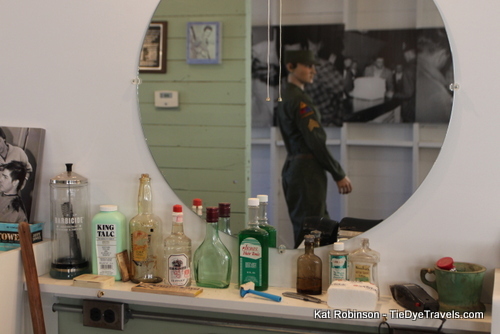 The Chaffee Barbershop Museum is worth a couple of hours of your time. Consider adding it to your itinerary, just as Hunter and I did on our epic road trip on US Highway 71 from the Louisiana border to the Missouri state line. You'll find the Chaffee Barbershop Museum at 7313 Terry Street inside the Chaffee Crossing Historic District on the outskirts of Fort Smith. It's open 9 a.m.-4 p.m. Monday through Saturday. Admission is free but donations are gladly welcomed. Remember to sign the guest book. For more information, check out this website. And if you get lost trying to find it like I did, call (479) 242-2724.